As some of you may be aware, the twisted minds at TIGSource regularly organise bizarrely-themed independent game-development competitions, and Rock Boshers was one of the stand-out (yet unfinished) entries in their recent 'demake' compo. For those of you unfamiliar to the strange (and recently coined) phenomenon, de-making involves taking a recent game and trying to remake it as if it was created for an earlier system; scooping out the still-beating heart of a current-gen release and surgically implanting it within the cadaver of an 8 or 16-Bit machine, stripping the visuals, audio and game-play right back down to the basics in the process. The results of the competition were impressive in concept, with conversions of Guitar Hero for the NES, REZ for the Amiga/Atari ST, Wipeout for the Vectrex - you get the idea. Dugan chose FPS underdog Red Faction as his inspiration for a Spectrum de-make; a 2001 Mars-based sci-fi game with the unique selling point of featuring 'GeoMod Technology' (basically a fancy way of saying that you could blow up certain walls in a semi-realistic manner). 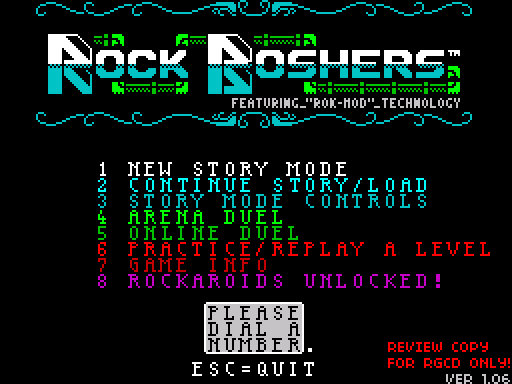 Rather than observing the specific details of its spiritual father, Rock Boshers uses the original game's rock blasting mechanic in a top-down Gauntlet style presentation. 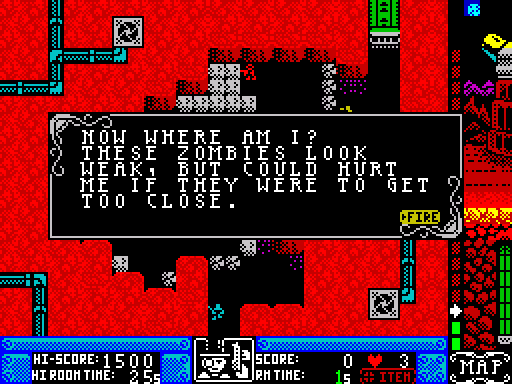 The setting has been 'de-made' in a Victorian steam-punk style, and then the whole caboodle has been very realistically disguised as a ZX Spectrum game. We now find our protagonist conned into travelling to a mine on Mars, and then having to fight his way out past the other slave workers and mine guards. As a solo game you are presented with a series of levels ('hours') to play, and you guide your player through areas populated by zombies to shoot, guards to avoid, switches to flick, gun turrets to disable, keys to find and hidden secret areas to stumble across. It is simple stuff - and the objectives are always clear - with a pretty well balanced progression as you work through the stages. 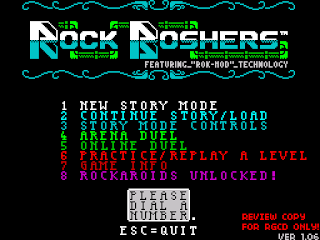 This does not mean that Rock Boshers is an easy game by any means - in fact, some of the later levels present a genuine old-school challenge, but thankfully the one-more-try factor is huge. It's also worth noting that each level records the 'best time' for the score-whores to try to beat on a later replay - and Rock Boshers is exactly the kind of game that you'll want to play through again and again. The presentation throughout is exemplary - the story has a well written and often humorous script that unfolds as you progress through the levels. The graphics are first rate in their retro-chic way, and the music and sound effects are nicely done. Special mention should go the whole front end with its very well executed menus - from re-definable keys that you can test, to onscreen instructions. The menu also includes a big-fat-lie, that both myself and the editor fell for (naive fools that we are). I shall let you work that one out for yourself. 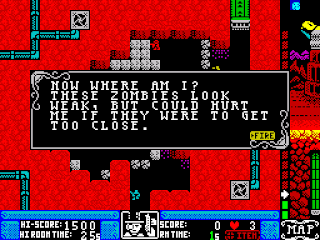 Although made in GameMaker, Dugan has taken great lengths to make Rock Boshers as convincing as possible in its homage to the days of ZX Spectrum games. Yes, it'll take five excruciating minutes to load, complete with loading screen and authentic audio (but luckily this feature is skip-able via a press of the spacebar - some things about retro gaming are best kept in the past! - JM). Also when playing the game you'll notice the graphics generally adhere to the rather odd colour map that the Spectrum forced upon us - 2 colours per 8x8 pixel character square. 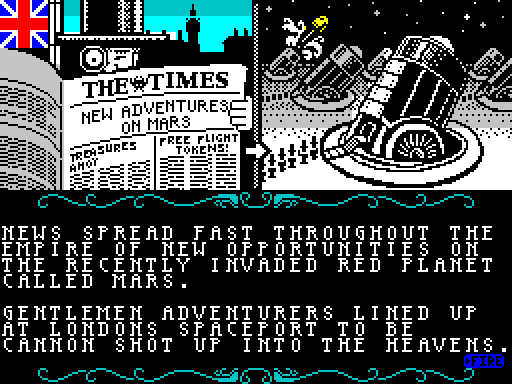 Both the backgrounds and sprites follow this, but as the sprites move they do not mimic the associated attribute clash that would have happened on a real machine. This is A Good Thing. The background story is told in a series of still screens with similarly excellent art at the start of the game, and there's even an introductory tutorial. 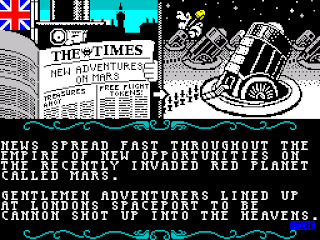 Overall this really does feels like a great and quintessentially British Speccy game, with the bad bits (colour clash and load times) removed. Recommendation enough I would have thought! If that is not enough to convince you, add a multiplayer mode for up to four players - simple crowded fun in one of four arenas. Hurling rockets at one another never gets old, no matter the game, does it? 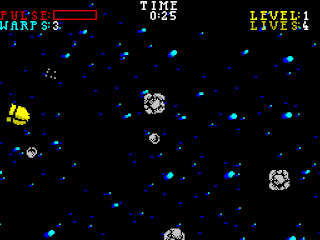 And then throw in an unlockable Asteroids style game - and not a bad one at that - which is your reward for completing all 10 stages of the main game. Rock Boshers is a very polished, stylish, compelling and utterly charming game. There is no excuse not to play it, regardless of whether you are a Spectrum fan or not. (Note that there are two versions of the game; a pixel-crisp edition (with some compatibility issues with certain graphics cards), and a special filtered build for those of you who want the full RF-lead blurry experience). Download the game here (from the official Rock Boshers site). As way of introduction, please could you give a brief paragraph or two about yourself? I'm an artist who has worked in the videogame industry for over ten years, working on most well known console platforms (as well as some of the more obscure ones such as the Gizmondo). You don't always get to work on the most glamorous projects (due to a whole range of factors) but it's usually the games with smaller teams that are most fun to make. I trained in traditional art at school and college, dabbling in Deluxe Paint (on an Amiga 500) and SEUCK at home - and only really got into digital properly at the end of Uni, using Lightwave3D and Photoshop. Although I'd always loved playing games, I never thought it was possible to work making them - you just never used to get that sort of careers advice at school. Why did you choose Red Faction as the subject material for your demake competition entry? I started off the TIGSource demakes competition with the basic premise of wanting to have rooms of rocks that the player could tunnel through, I liked the idea of some people tunnelling to escape whilst others would be tunnelling to attack - in theory each game would be different as you would create you own play area. It was fun to ignore the original Red Faction plot (bar the initial going to Mars), and to devolve the whole thing back into some pseudo Victorian era. And what was the reason for selecting the ZX Spectrum? Time constraint was part of the choice, choosing a low resolution and colour platform hoping it might speed development - and what better old hardware that the ZX Spectrum +2 - it was my first computer! There were so many awesome games on that machine (R-Type, Rainbow Islands, Robocop, Carrier Command... I could go on for a while) although sadly only a few stand up so well if played today, many are now far too hard and require a lot of patience and replaying death after death (even loading the games requires a lot of patience!). I'd always loved quality spectrum game art, so this seemed a good time to try it out. Was it hard to achieve the authentic Spectrum look-and-feel in GameMaker, and what your thoughts on using GM as a development tool? Well I had looked at GameMaker about a year before this point, and tried a couple of freebie demos (the 1943 clone for example) and was really unimpressed with what I saw, so gave up with it there and then. Months later I saw a Youtube video of 100 Gamemaker games (I think via TIGSource) which totally changed my mind, you could see an amazing variety of styles and genres were possible with GM - so I thought I should give it another try. Getting the Spectrum look with game maker is pretty easy - the only big pain was that GM filters games if you go full screen, so a pixel sharp fix had to be retro-fitted to the game down the line, which is not the best way to do things. Also, the art isn't 100% Spectrum graphics hardware accurate, if you look closely you can see I have cheated in places, but overall I think it looks the part. Aside from GameMaker, what other development tools were used to create the game and could you briefly describe the development process? The art for this game was for the most part very simple looking, so it could be drawn with the pencil tool in Photoshop and then imported into GameMaker. The backgrounds to the game are each one image, which isn't the most efficient way to do it (really should be cut into tiles) but it sped up the creation process. To remind me of what a ZX Spectrum was capable of, I did a bit of initial research collating screenshots of games I remembered enjoying back in the day, to use as a benchmark. For most of the sound FX I used a superb sound generating tool called 'sfxr' by Dr. Petter. Its great for making retro-sounding effects. Being new to GameMaker, I didn't know if it had any sound limitations or quirks (such as if it had memory limits) so just went for the smallest sized samples I could, making them all 8-Bit and low sample rate (which suits the retro theme of the game too). The music was a bit hellish to do, i found a tool called Vortex tracker II that is meant to be an accurate Spectrum tracker program. Being so accurate it was not at all user friendly - the samples were generated from number tables so there was a lot of trial and error to the whole thing. That and my lack of musical skill resulted in the rather short looping track that you find in the game. For Rockaroids I used a simple webcam mic and a fun vocoder program called Cylxv200. Once I nailed what I wanted to do (theme/basic gameplay) the development process started with a week of frustration trying to get the basics of GameMaker (helped by looking through a few peoples game examples), then after that just a cyclical loop of making art, coding things up, adding sound if needed etc. There was a fair bit of time wastage from just learning how to code things up, then finding problems with it, then finding a better way to do it, discovering new GameMaker functions and re-coding. Character movement is a good example, 1st pass I got it moving in 8 directions, then I added stopping when hitting walls. But that was based on touching a wall, so you couldn't 'slide' along a wall. I worked out a fix for that, and then found issues with narrow tunnel junctions (e.g. push in the diagonal and you would get stuck into the junction corner). The level order never changed that much, just a few got swapped around as I thought up new designs. Work on the game wasn't full time, so I just had to dip into it when I could - and that taught me to comment my code when possible, as there's nothing worse than coming back to something you made a week or so later and having no idea how you got it to work. So... How about actually coding it for a ZX Spectrum? Interesting idea, but not for me thanks - I'm not anywhere near good enough a coder. I guess it might be fun as an exercise for someone, but I think games should be made for people to play, and making them on dead hardware doesn't sound like it would be worth all the hard effort? Are there any further plans for Rock Boshers, or is the game now complete? There's nothing else planned bar a small webpage or two for the game. The new version (1.06) hopefully fixes all the issues of the old one (better save system, joypad support etc) and even has a built in asteroids clone which you can unlock, and that is itself a spin-off from the ending of Rock Boshers (you could call it a mini-sequel I guess). It has 2 game modes; the first is an 8 level game with a boss at the end. 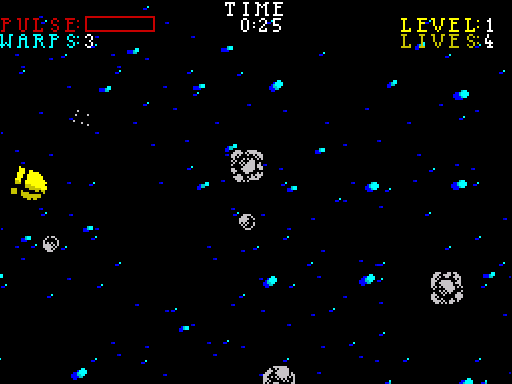 The second is more traditional asteroids, with infinite levels. With regard to the independent gaming and remakes scene, are there any recent releases that have captured your attention? Derek Yu's Spelunky is fantastic, far too hard - unreasonably hard in fact, but something about it just works. On the remake side of things - I'd like to try out R-Type Dimensions sometime; I'm a bit of an R-Type nut and have played most versions out there. The new 3D art skin they put on it has me a little worried, it doesn't look nearly as good as Gradius V on the PS2 in still shots - and the explosions look a little woolly (again look to Gradius V as an example of how to do it right). Thank you for participating in this interview. Is there anything else you'd like to add before signing off? Well, thanks again for taking interest in my game. Just making it turned out to be a bit of a nostalgia trip for me, so I hope some of that comes across for players too.